Defense is difficult and requires constant awareness. In ultimate the offense has nearly every advantage, from knowing exactly what they are going to do, to controlling the ebb and flow of disc movement at almost all times. In reality, defense is pure reaction plus good anticipation, whether playing an individual or team defensive set. As a result, every tool available in the defensive arsenal not only needs to ready at all times, but should be sharpened to as fine a point as possible. With such difficult challenges facing a defensive player, it can be very tempting to hyper-focus, to suffer from tunnel vision on an offensive individual. This face-guarding strategy does connect to the most basic idea of prevention: if you never lose sight of the person you are guarding, you are far more likely to be able to stay close enough to either reach the disc or prevent a throw. There is even a time for this temptation—every player at one point or another feels the need (for it is a necessity), to hone in and buckle down. Face-guarding, however, is not a sustainable defense. More often than not, it results in tightly-contested passes, but fails to get blocks. Or, even worse, it gives absolute power position to a good player. Only because of an extremely athletic play or a slightly errant throw (or both) does one get blocks in this situation. Good defense therefor requires more advanced and subtle work, technique that is far more difficult and far more likely to help prevent offensive movement. Using far more than raw athleticism, a good defender has the knack of seeming to know where the disc is at all times, and appears to perfectly anticipate the next offensive move. One of the key components of this artistic discipline is the ability to look over your shoulder. Seems simple? It’s not. Truly good defense requires constant vigilance and observation. A veteran knows that the best initial defensive positioning begins with a stance where a player can see both the disc and the person you are guarding. But a veteran also knows that it is very difficult to keep this position consistently throughout the point, especially when you’re chasing down one of the other team’s best players. It takes great instinct or experience to keep your hips pointed at your mark, move to adjust throughout the point to hold the force on the mark, maintain readiness to instantly bid for the disc. Doing all of that at full speed is a rare gift. Once more the difficulty of defense becomes obvious, especially isolated one-on-one matchups against fast players. Instead, to succeed, defense needs help—as much information from as many sources as possible. This means team defense relaying audible information from the sideline, explaining where the disc and players are. But in the end, even that is not enough. The best way to be aware is trust what you see as often as possible. A good player has their head on a constant swivel. 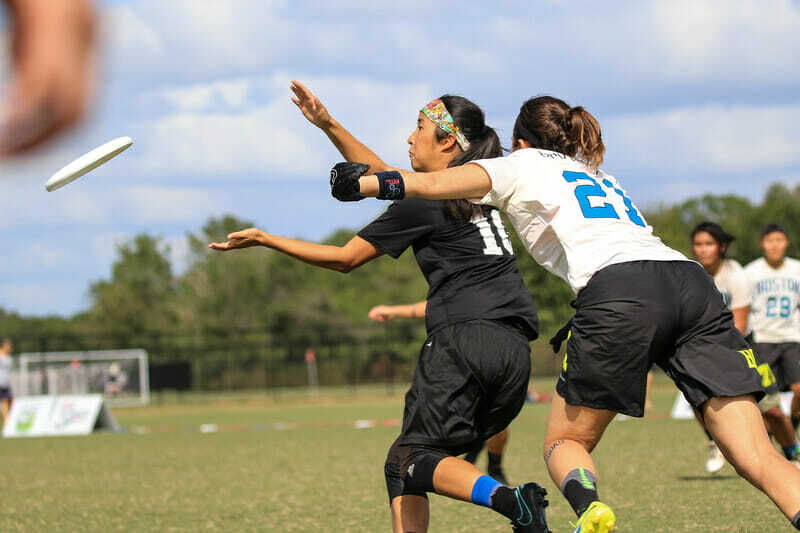 Whether it’s to know whether the disc is coming, a flash or poach is available, or where to adjust your body positioning, there is a need to constantly look around the field on defense. Take these tips on when its most important to look around on the mark and why you should look over your shoulder as often as possible. Vision is key on defense. In the moment, at full speed with tired players, it is very hard to know where and when people are moving. Sideline communication is essential, but there are still a few important times to take your eyes off your mark and look around for yourself to be better able to respond. The best and most important time to look over your shoulder is the moment before you step up to the mark. Now this might seem unnecessary. When your person is about to catch the disc is the one time during a point when you know exactly where the two most important things on the field (your player and the disc) are located…why look around? You should focus on setting a mark, counting the stall, and holding the force. Actually, the moment before your person catches the disc is a perfect moment to survey the field with a quick look over your shoulder. True, it is the one point when you absolutely can ascertain where the disc is. But rather than just get frustrated and put on a hard mark, look around first, especially as you run to reposition the force. The tendency to hyperfocus returns, with players wanting to key in on just one person. Resist that urge and look around. As best you can, in a quick glance or two, try to determine exactly where the rest of the players on the field are. This will give you as complete a picture as you possibly can get while playing, giving you the best defensive positioning you can have. First, look for the immediate threat. Most often, a good offense will have a continue cut coming as a well-timed opportunity for your mark to throw. Finding the route of that cut, especially if it’s on the breakside, is a great way to shift your mark and stop the most immediate threat. Adjusting to a no-around mark on a swing for example, can cut off an immediate continue, hold the force, and possibly save the point, all because a player had the wherewithal to glance over the shoulder. Even if there isn’t an immediate threat, a look over the shoulder can help clarify threats on the field and positions of players (both offense and defense) and give the defender a better opportunity to establish good position when not marking the stall. Once the disc is moved, you immediately can respond and be prepared to spring into action. The second best time to check the field is when your person is clearing out. You’ve done a great job. You’ve shut down the cut and prevented your person from getting the disc. But your ability to impact the point isn’t over. It’s very important to take that brief moment when you feel your mark is safe to look around the field. Again, your primary mission is to look immediate threats. If your mark’s clear is an immediate set-up for another cut or a deep shot, then you have barely a second to glance before you need to find position and get back on your person like glue. On the other hand, if your person is out of the action in a sideline clear, but someone else is streaking wide open, you might be able to flash or switch immediately to prevent (or even better get a poach block). A great defender will also take this moment to look over shoulder and adjust his or her position accordingly. Seeing the field let’s you shift in a variety of ways. First, adjust your closeness to your mark, depending on how much of an immediate threat your mark presents as a receiver. Next, identify the biggest open space and adjust under or deep accordingly. Finally, be prepared to communicate, both to the mark and to other downfield defenders, on ways to help, switch, or adjust to better use team defense. Seeing this in other sports, the switches come fast and immediate. Help defense, with the whole team working together efficiently and fluidly, is truly the only way that defenders have any chance to shut down the opposing unit. One of the best things you can do, once you identify that your person isn’t the immediate threat, is position yourself laterally away from your mark. In other words, if you can, take steps towards the middle of the field and the threat space. This will help your team by giving you best perspective and communication. Oftentimes, this can lead to a little poaching or preparation for a switch, but not always. If you can, stepping off the mark for a few feet and surveying the field can be an important addition to the team defense just through your eyes and voice. Start primarily by worrying about your own responsibility. If your person is stationary for the moment, then move laterally and be prepared to help. Look over your shoulder and survey the whole field. Here’s a prime chance to reposition yourself once more at the very least, and be well-prepared to anticipate the next move and be in prime position to see both the disc and your mark. At its best, your presence in the middle might prevent a throw, or give you the opportunity to help or switch. Take these moments to look around as often as you can and communicate to your teammates. For the inexperienced, these brief windows of opportunity usually pass by quickly. A good player can recognize those few precious seconds to step off laterally from the mark, survey the field, and immediately respond as soon as the offense initiates. Even three seconds of stepping off the back of the stack, for example, might be enough to prevent a huck throw, communicate to a teammate, and get into the best possible position for your own opponent’s next cut. It should be obvious, as it is the easiest spot to survey the field, but stoppages are often forgotten about. Players are so focused on what’s happening on the field, discussion or disagreement, that they don’t take the moment to refocus on themselves or their teammates downfield. No matter the outcome of the stoppage, on defense you want to be best prepared. The moment there is a pause, whether for injury, foul, or violation, you need to be looking around constantly. Watch the best players in the game, and in these minor moments, even of the “no contest” variety, they are shouting to teammates, pointing out threats and matchups, and subtly adjusting their feet. A great team will see two-three players abruptly move the moment the disc is tapped in, quickly rushing to stop the immediate threat or readjusting to the fundamental key positioning of seeing both the disc and your opponent. The zone or junk look takes the team defensive scheme of help, communication, and vision and embodies it fully. In many ways, that is why zone defense is so effective; in its ideal state, zones or junk cover all areas of the field, leaving the offense with no desirable option. The reality is, of course, that zones often do fail, largely because of breakdowns in fundamental tenets or because of skilled throws past marks (with defenses then struggling to have to adjust). The difficulty in person defense is staying close to your mark without totally face-guarding. In other words, you usually have to pick between focusing in on your defense or watching the field. Zone positioning allows you to take half the equation away. Since you are guarding space and picking up people that enter it, you can spend more time looking over your shoulder and understanding positioning. Always be aware of where other players are on the field, look around more often, especially to check for threats behind you, and be constantly adjusting your position. A bad zone defense features a lot of players standing in spots regardless of where cutters are moving. A good zone defense is always moving, talking, pointing, and readjusting. A good defender is an aware defender. Looking over the shoulder while on defense is quick, fluid, and difficult. A team that is able to use field vision and communication is a complex moving machine. Like a musical composition or a piece of theater, with so much happening all at once, it can be very difficult to break down, and therefore learn from, the completed product. More art than science, good defense is something that requires lots of practice and experience, as well as good chemistry between players. Still, having knowledge of critical situations is a stepping stone that can lead any player, novice or otherwise, to play well. The best players will look over their shoulder (and around at the field) as often as they can, continually adjust their positioning, communicate their defense, and coordinate with their teammates. When it works perfectly, each piece comes together and defenses can anticipate, respond, and attack in a performance that is lightning fast and beautiful. Take these instances and practice them on the field; become a better player by learning the art of looking over your shoulder. Comments on "Tuesday Tips: The Art of Looking Over Your Shoulder, Presented By Spin"